When it is necessary to pass data of a certain type to a report at run time (e.g., to pass a specific value to its filter string or a calculated field), you can avoid writing any code by utilizing parameters on the Run Report form. 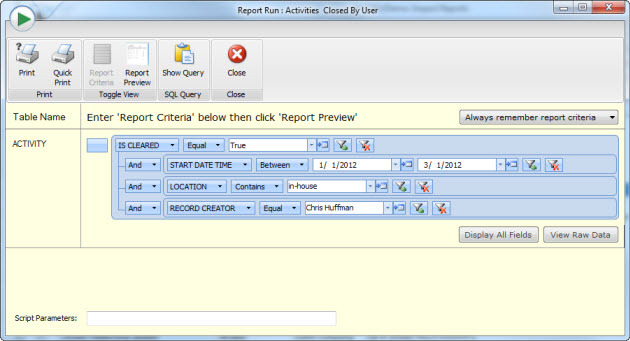 This form has a drop down options to 'Always remember report criteria' so you do not need to fill your criteria in each time. The 'Script Parameters' text box at the bottom will pass additional parameters to custom VB or c# script in the reprot.